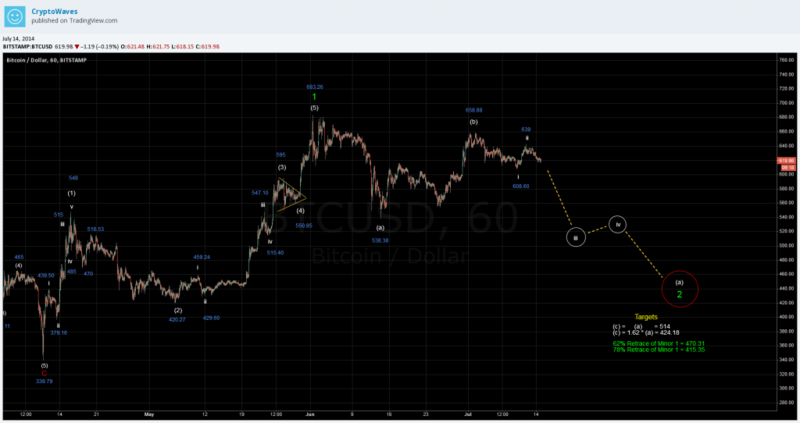 I found time to update the hourly Bitcoin / USD wavecount – let’s dive into the details. The recent top at $683 is labelled as the end of Major 1, meaning Bitcoin price is currently working on a Major 2 retrace. The drop down to 538 caused an overlap with the labelled Minute wave (1) high, so the high has to be the end of the five wave move up. Ideally, I would have liked to see Minute (4) last longer in time because it looks out of proportion in relation to the time it took for Minute wave (2). Other than that small detail, I feel that the structure and Fibonacci extensions of this count look very good. The overlapping price structure since the 683 high suggests that price is moving in a corrective manner. I expect Major 2 to retrace 62% to 78% of the Major 1 move. This gives a target of 470 to 415. Note that the next minuette wave on the hourly chart is a wave iii down. If the move down does not gain speed soon then it is possible that wave ii is not finished. Wave ii should not move higher than 642, the 78% retrace of wave i down. Finally, the wave count as labelled becomes invalid with a move above the (b) wave high of 658.88. Feel free to ask any questions about the count or let me know if you need simpler explanations in some areas. See you next time and good trading!